Need a custom handrail or guardrail post for your railing system? Shop at PRL Glass & Aluminum. We offer a wide variety of customization for commercial and residential applications. Whether your project calls for a unique post height, shape or railing configuration, we can accommodate a diverse range of designs. Available in a collection of stainless steel, powder coated and painted finishes, these handrail and guardrail components are flattering indoors and out. At PRL, our handrail and guardrail posts are made to order. Furnishing stainless steel and aluminum systems crafted to your specifications, these materials have a lot to offer. Rendered in a large assortment of post heights and profiles, our most popular sellers include round styles in 1 1/2″ or 2″ diameters and 2″x 2″ square tube 1/8 wall thickness. For greater versatility, handrails and guardrails can be design to accommodate fix or adjustable glass brackets. 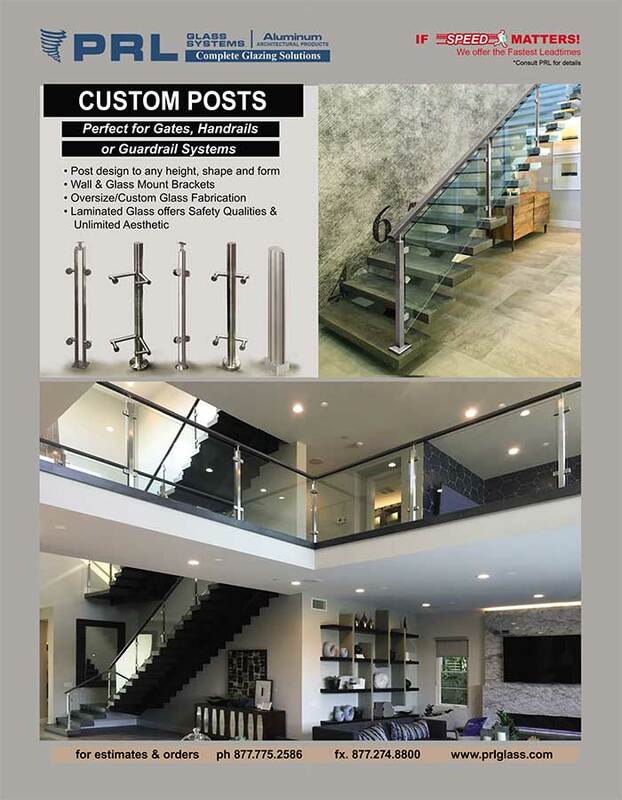 Accepting a vast array of glass types and thicknesses, these railing posts can be fit with tempered or tempered laminated glass, custom sandblasted designs, over sized glass panels, and more. In addition to traditional in-line configurations, our custom posts enable numerous railing layouts. These components can accommodate a host of end and corner railings in 90˚and 135˚. Ideal for specialized angles, PRL’s systems can create radius’s utilizing flat glass with posts located at segmented positions. For even greater versatility, handrails and guardrails can be equipped with standard or adjustable standoffs, glass, or wall mount brackets from our broad collection. Also be sure to watch our newest video on Handrail & Guardrail Posts. Discover Diverse Railing Configurations available from PRL. Laminated Glass Supplier with Endless Capabilities! Fire Resistant Glass. You Can’t Stay Protected Without It.